World 8-6 is the eighth course of World 8 in Puzzle & Dragons: Super Mario Bros. Edition. It is a volcanic cavern level with enemies consisting of Buzzy Beetles, Spinies, Big Paragoombas, Bony Beetles and Fire Bros. This level starts with a single battle, after which the player reaches a branching path with a green Warp Pipe on the left, a Gold Block in the center, and a sign on the right. The green Warp Pipe requires the player the clear more Wood Orbs than other Orb types to enter, the Gold Block in the center requires more Dark Orbs to produce its Beanstalk, and the sign on the right requires more Water Orbs to be cleared to take the path. Taking the path on the right, the player faces six more battles before the boss fight with a Big Bony Beetle. Taking the green Warp Pipe on the left, the player enters an underwater area and faces three battles before reaching another branching path, with a sign on the left and another green Warp Pipe on the right. The path on the left requires the player to clear more Dark Orbs than other Orb types to proceed, however the course itself does not provide Dark Orbs so the player needs to bring an ally that can create them, otherwise they are forced to enter the green Warp Pipe, placing them back at the main area, at the second-to-last battle before the boss battle. 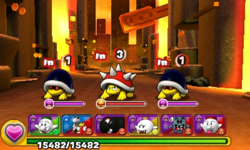 Should the player have Dark Orbs to take on the left, however, they face two more battles before the boss fight with "Blooper & Cheep Cheeps". Clearing this course with this secret path unlocks World 8-7. To activate the Gold Block in the center, the player needs to bring an ally that can create Dark Orbs as the course itself does not provide them. Climbing the Beanstalk produced by the Gold Block, the player reaches an underground area and finds a ? Block, faces three battles (the second battle occasionally having a King Blue Coin Coffer or a King Green Coin Coffer), finds another ? Block before taking a green Warp Pipe to the underwater area (thereby bypassing the second branching path) and directly to the alternate boss fight at the end. ★World 8-6 is a difficult version of World 8-6 from ★World 8. The Orb configuration for this Special World course matches that of its normal world counterpart. Clearing the course by taking the secret exit unlocks ★World 8-7. When a Buzzy Beetle is accompanied with a Coin Coffer in the cavern section, it rewards the player with less XP and Coins: 4218 XP and 8 coins. This page was last edited on January 27, 2019, at 20:05.